Tracy MacLauchlan, co-creator of Taffetas writing! Today, Yesenia and I present our first public draft of the new season 01 synopsis for our pitch book which we hope to gain your thoughts on. We started reworking our entire concept a few months ago, and with the episodes coming together we are now over the hardest part of our revamp. What you are about to read is the accumulation of the changes we made, all the brainstorming and research we did, and the incorporation of our new found theme. Which episodes or scenes would you like to see concept art of? Gemini, a bubbly Atlantean, lives a sheltered and lonely existence at sea until a shipwreck leaves her landlocked in a city filled with mythological folk. Determined to start a new life, she takes up a half-hearted offer to move into the apartment of her uptight, frustrating and undead crush Veil Taffeta, a passenger from her ship’s last ride. However, determination alone may not be enough to get her new life in motion. Dangers lurk around every corner, and in a world where fantasy is reality, a girl can fall into a lot a trouble . . .
Gemini wants to go to a mysterious circus traveling through the city even though Veil wants to keep her focused on finding a job. When Gemini decides to go anyway, she is lured into participating in “their most spectacular act yet”, a ploy by the fae who run the ruse of a circus to get her to step into a Fairy Ring, a ring of mushrooms which traps its participants into dancing in a reverie of their desires until they die of exhaustion. Even though Veil manages to save her and get her home, Gemini is compelled to return to the ring. When she makes a second, conscious attempt to enter the trap, Veil becomes infuriated with her impulsive immaturity and tells her off. In a fit of emotion, Gemini accidentally pushes Veil into the ring. Time is running out before the Great Barley & Bay-Lily Circus disappears, and Gemini has no one to turn to for help. In desperation, she enters the ring herself, and must weave through Veil’s maze-like ballroom dream and also battle her own desire to accept the reverie over reality in order to save him. When she succeeds, she vows to take her goal of building a new life more seriously. Veil finds Gemini wandering in a bad part of town after she failed to show up at a rendezvous point. He confronts her about her naivety and tries to convince her to be more careful after finding out that she has been conned by a few trickster gods in her time away from him. He then notices that they are being followed by a Kappa, a creepy and malicious Japanese water demon, and Veil attempts to steer the two out of danger. However, Gemini, oblivious to the stalker, decides to convince Veil to deviate from his boring routine and forces him to join her in exploring the city. Her random stops to various shops help deter the stalker, and in the end, she saves them both when she offers the kappa a cucumber, the water demon’s favorite treat, and successfully distracts it. Veil takes her home, and Gemini never knows the danger she was in. Gemini tries to hide her curiosity about Veil, but it becomes difficult when he constantly refuses to unwind. The two have no time to discuss the matter when they discover his guest bathroom has a curse placed on it, making the only accessible bathroom available is through his bedroom, a room previously kept locked to her. When an aquarium opens up just outside of Veil’s work, Gemini leaps at the offer to check it out with him during his lunch break. However, she finds it hard to enjoy herself when Veil invites some of his co-workers, which get in the way of her alone time with him. Veering away from the crowd, Gemini spots a man trying to free one of the seals from the tank. She learns the man is in love with the creature, secretly a selkie (a person with the ability to turn from seal a human with the shedding of a pelt), and wants to help her return back into the ocean. Moved by his love for the selkie, Gemini helps the man free the seal, but lands herself in trouble with authorities, and Veil must bail her out in front of his co-workers. Luckily, Veil’s friend Tom from legal proves helpful in clearing the girl’s name, and Gemini finally gets her alone time with Veil in the aquarium. 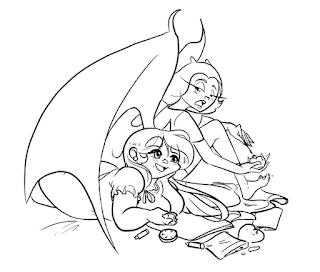 While job searching, Gemini makes a possible friend with cool, beautiful Sapphire, a fiercely independent gargoyless. She is elated when she is invited to Sapphire’s home for dinner and even more excited when the many residents of Sapphire’s house – such as Wolf, a laid-back werewolf, and Sapphire’s many cousins who bum there, take a liking to her. However, Crow, an old enemy from her life at sea who knows a dark secret of hers, is also one of Sapphire’s cousins. Through a series of misunderstandings and Crow’s testimony, Gemini loses favor with the Sapphire and the rest of her household. Veil shows Gemini around the city to try to cheer her up about the incident at Sapphire’s house. It works, until he takes her to Siren’s Coffee, a coffee shop run by sirens, and Sapphire and Crow are there. Desperate to win back Sapphire’s favor, Gemini spends the rest of their time trying to impress and persuade Sapphire and orders the same drink as her…only to consume caffeine, which Gemini is overly sensitive to. She causes a ruckus for herself and Veil as a result, and Sapphire’s feelings for Gemini do not change in the end. However, Veil reveals that he thinks he and Gemini are friends. Gemini and Wolf, an artistic werewolf from Sapphire's house, join forces to take on a series of cake-making contests. Veil starts to disapprove when the competitions distracts Gemini from her job search. However after winning second place in a competition, Gemini ends up finding a job at a bakery. In order to keep her new job, Gemini must get some papers cleared at the DMV, which in this world runs like the Egyptian Afterlife. Unfortunately, Gemini never had the chance to resolve her earlier blunder with Veil and is unsure whether he is still holding a grudge. While Gemini is pulled from one office and line to the other, she finds it hard to get a moment to talk with Veil. Finally, Gemini is put in front of Anubis, and must have her heart weighed against a feather in order to get her permit. Her heart is heavy as a rock. Anubis knowingly mentions that she has a lot of dark secrets, and denies her papers. The stress of having no job, friends, having Veil mad at her, and knowing her heart is heavy causes Gemini to burst out crying. When Gemini is gone all day without telling Veil where she is, she returns home to a fight with him over her safety. Feeling stifled and controlled, she storms off again into the city, where she finds Sapphire and Wolf searching for Sapphire’s gentle and naive cousin, Daisy, who never returned home the night before. After reluctantly asking for Gemini’s help, they try to retrace Daisy’s steps. The search lasts all day and eventually into the night, where a full moon begins to rise. His instincts growing stronger with the full moon, Wolf senses a foreign animal in the city - a deer - and gives chase. When he injures it on instinct, it is revealed that the deer was Daisy, cursed by a witch to live her nights as a fawn rather than to spend them with Wolf, her secret love. Gemini goes on a ladies night out with Sapphire. 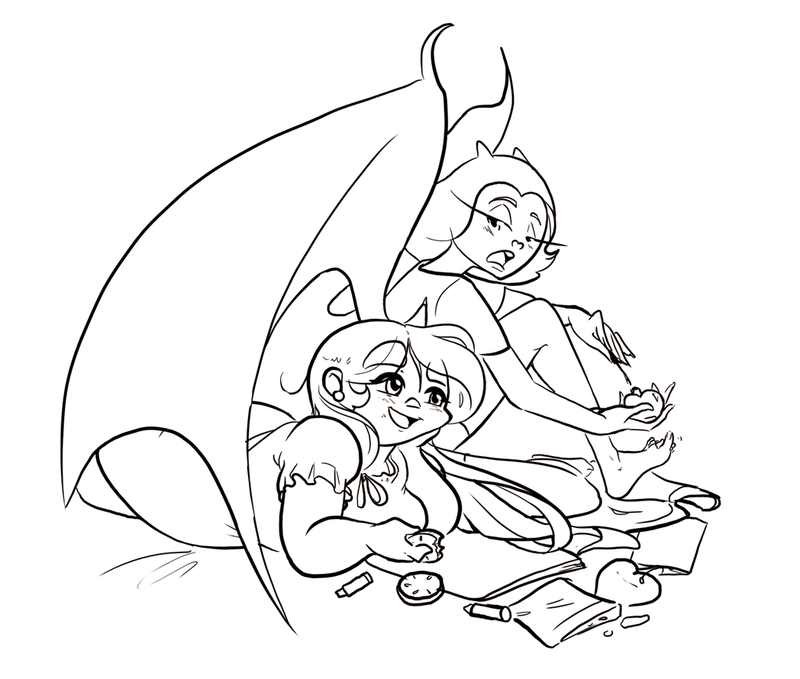 The rambunctious gargoyle entices Gemini to try on new clothes, experience new things, and be just a little more bad than she is used to. Unfortunately, Crow, Sapphire’s cousin with a brgrudge against Gemini, is determined to make the night a complete blunder. Gemini begins to fear that Veil finds her more annoying than attractive when she notices he pesters her more than he does anyone else. In her frustration, Gemini slights Elena, a waitress at Siren’s Coffee, who in turn targets Veil, a daily customer, with her powers of persuasion to get even. Elena orders Veil to care only for her. With Veil suddenly paying Gemini no mind, she fears he’s fed up with her, too. But when Veil begins to irk Elena with his over attentive nature, the siren seeks Gemini’s help for an out and Gemini realizes Veil has liked her all along. When Tom’s mother comes to visit, she’s pleased to find her son finally settled down with a nice, young girl- really just Gemini in costume, acting the part. The fake marriage between Gemini and his friend bothers Veil until he decides to “watch over” Gemini during the ruse by slipping into a costume of his own. After he arrives, Veil reveals his feelings for Gemini with a kiss in front of Tom’s mother. Gemini ventures out of the apartment to get all the groceries she couldn’t convince Veil to buy, but quickly gets lost. Determined to make it home without calling Veil, she ambles around the city. Along the way, she sees Midnight, the cat Goddess and captain of the boat she lived on before it crashed. Gemini desperately tries to get the captain’s attention in hopes to reunite with the closest thing she has to family, her old crew from her life at sea. When Gemini finally catches up with Midnight, she learns that that the captain, along with most of the crew, is shipping out that day. The captain offers to take Gemini with them, but she declines the enticing opportunity. It is then Gemini knows she is cutting off all ties to her old life, which wasn’t much of a life to begin with, but finds it hard to be left alone all the same. This exciting conclusion reveals Gemini’s secret and explores what happened during the fateful boat crash between Veil and Gemini. Unfortunately, her secret may mean the end of the life she just gained. With everyone's help, we will refine this synopsis based on critique and finish up our other seasons, which may even include an episode synopsis for season 2. After that, we will create our character bios for the pitch, refine all of our writing, and begin the pitch book and concept art! You can be a part of the creative process by posting your thoughts and critiques about our season 1 draft here on the blog, our facebook, or by e-mailing us at info@thetaffetaspitch.com. We're always looking for critique on our writing. If you find any errors -including spelling mistakes, weird sentence structure, or something that just doesn't make sense, please let us know! The Taffetas © 2011 Tracy Maclauchlan and Yesenia Carrero. All rights reserved.